» The tax on this house is WHAT? The tax on this house is WHAT? The listed asking price for this house at 405 Denver St. N.E. is $159,900. This house overlooking Bowman Park and the Willamette River was last in the news in 2016 after the city of Albany accepted title of the property, which had been used as a squatters’ hangout. Now it also illustrates that our property tax system is out of whack. The property at 405 Denver St. N.E. had been trashed inside and out. The city of Albany acquired it in March 2016, had it cleaned of several truckloads of debris, and boarded it up. Now, as I noticed on a bike ride the other day, it’s been listed for sale for $159,900, which seems like a pretty good deal for a place with six bedrooms on two floors. The Linn County assessor as of this week claims the lot and house together have a real market value of $269,620. The tax this fall, on the assessed value of $262,470, is $5,298.93. For the last few years, the place had been in a bank foreclosure, and someone, presumably the bank, dutifully paid the taxes every year on an assessed value far higher than what the property was worth. I’m not sure who if anyone is going to pay the tax now that the city holds the title. Maybe the bank will continue to pay it to preserve its mortgage rights. But think of it — a combined property tax bill of nearly $5,300 on a place that can’t be lived in without extensive remodeling and repairs. This year’s listed tax bill on that property, by the way, is 10.3 percent higher than last year’s. That seems to be about the normal range for tax increases on Albany properties this fall. Another place I checked, a modest little house on the west side, showed an increase of 9.4 percent. The sharp increase is the apparent result of the blanket 3 percent rise in assessed value allowed by the state constitution plus the boosts that voters approved for city, school and community college bonds. We have been getting screwed for years,where will it stop ?? Only half the people are getting screwed so it will never change. By searching the county tax rolls you can easily find half million dollar homes that are taxed at a similar value to this home. The system created by Measures 5, 47 and 50 created this mess. If voters approved rate hikes for school bonding, then in all fairness, Mr. Hering should also include equal time for the community-wide and immense benefits which come to societies who desire their children to have sound educations. No one enjoys forking more of their cash than necessary. That said, the bond measures did pass. The costs of passage were publicly published, discussed and voted on. The solution for the disgruntled is to move where city services are not provided for by taxpayers…Pyongyang comes to mind. This requires some intellectual integrity on his part. Alas, he has none. But Hasso, I’ve been hearing for years that, had it not been for that evil Measure 5, our schools and communities in general would be amazing. Just give them what they want, and they will spend it wisely and leave you alone. This clearly points out why property owners need to read their tax statements and address issues either directly with the Tax Assessor’s office or appeal to the Board of Property Tax Appeals. It’s obvious that the Real Market Value (RMV) for this home is a bit out of whack and there is good evidence to prove that. Taxes are assessed on the lower of MAV or RMV. It’s also possible that the large jump may be tied to a shift from being taxed at one, and then with market changes going to the other. I’ve found the Linn County Tax Assessor’s Office is always ready to help someone understand their taxes, and if there are issues to resolve them. Somebody fears not the taxes. A quick look on the intertubes and I see that this property in under contract. 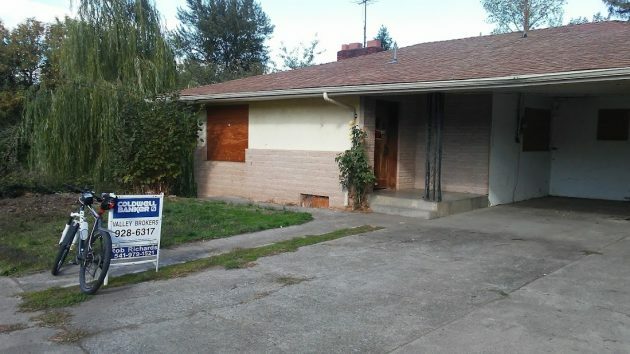 If someone pays $159k for it, they can get the property basis adjusted down.